Book by: Richard Del Connor, "The Hippy Coyote"
size: notebook: 8.5" x 11"
In the absence of a lover or love affair, Richard's creativity and romantic nature explored their farthest limits of imagination and remembrance. After purging himself in his Rainbow In The Shade poetry book, Richard discovered some romantic memories hidden for decades. These unanswerable questions drove our poor Zen Pup into a poetic odyssey of self-discovery. 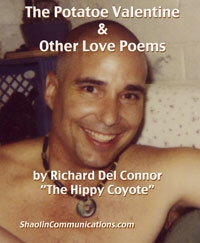 These poems are the intellectual and spiritual journey of Coyote's submission to his memories. Follow his poetic soul's quest for love with willingness to take the blame for lost loves. In 2010 Richard wrote most of the Human Values for Success in Family and Business. He was proud to announce it's completion on his birthday of 2011. This is the book that bridged the gap between Coyote's romantic memories and the unknown possibilities due to the secrets and deceptions he was a victim of.